With the boom in mobile computing, people are looking for better ways to surf the internet. While the default browsers that ship with Android and iOS devices (chrome and safari) are already quite good, there are many other browsers that providing more distinct features to demanding users. Here are some of the best web browsers for android and iOS. Besides being wicked fast, puffin browser (Android, iOS) bring a lot of interesting features to the mobile browser field. First off, it carries full support for adobe flasher, allowing for the consumption of flash media and games still prevalent on numerous websites. Virtual gamepads and trackpads allow for various controls and mouse-pointer style navigation of websites. Another neat feature is the ability to download files straight to your cloud service of choice, saving further bandwidth. Add-on support lets users and even more customizability. A feature packed browser, iCab trades elegance for power in a slightly clunkier, desktop-like package. iCab includes tabbed browsing, a customizable URL-based filter for ad blocking, a full screen mode, download manager, private browsing, user agent spoofing and more. iCab also includes a fair amount of mobile-oriented features, such as multi-touch gesture support and page compression to save on your mobile data cap. It could be accused of feature bloat, but chances are, if there’s a browser feature you’re looking for, iCab got it built in. Dolphin (android iOS) stays strong when it comes to powerful, feature-packed mobile browsers, packing a variety of tools options, and addons that let you make the most out of mobile browser. Standouts include gesture bookmarks that allow you to draw letters to jump straight to your favorite sites, as well as sonar, a voice-driven search tool. Addon support, custom gestures, tabbed browsing and more are also available, making for a highly configurable, feature rich mobile browser. While early versions of safari on the iPad were lemons that lacked tabbed browsing and other power features, the apple browser has been steadily improving. An omnibar-style URL/search field is cleverly hidden until needed, while swipe driven controls replace the traditional forward and back button, and a card style tab view makes it easy for users to browse between numerous open tabs. Do not track, a password generator, parental controls, and private browsing are among the numerous other features making their debut in the newest iterations of safari for mobile. A new browser by the developers of opera, coast breaks from the mold of most mobile browsers. Coast eschews the traditional address bar and forward/backward buttons, presenting a full-screen browsing experience with only a home button to return to the speed dial/search page, and a tab page. Navigation is driven by swipes, with left and right swipes to go forward and back, and swiping down to refresh pages. It’s a very different browser interface that works surprisingly well on the touch screen. Opera coast is also working in some of opera’s main features, such as the opera turbo system for compressing images and media for faster loading times. 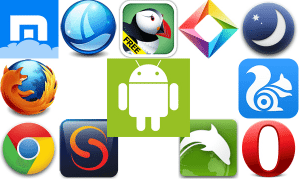 There you have it: your picks for the best web browsers for android. Now it’s time to decide which one is the best overall.